Please use the external doors to access the toilet and changing room areas when wearing wet gear. A member recently slipped on the internal stairs which were soaking wet. These stairs are also used by the bar staff to access the cellar. Experience a traditional French evening with food cooked by Chef David Lowes and his French Maids (Donna Hender has promised to wear full outfit!). Live music. £8 per person. Don't be disappointed - book now behind bar !!!!! Volunteers are required to man the tea bar commencing 1st Nov and running to the end of the season. Full instructions will be given. To register for information contact Donna Hender on donna.legs@btinternet.com. This is a subscription reminder. Members are reminded of Rules 30-33 in the Club Rules which state that members who have not renewed their subscription by 1st November are deemed to be no longer members of the Club and may not use the club facilities or record race results. Please renew your subscriptions as soon as possible. General Committee - 13 October 2009. Class Captains on their way to the top..
Our fearless Cadet Class Captains Siobhan Lamb and Alicia Clifford took away a trophy for Third Place in the Hobie Dragoon Nationals at Poole Last Weekend only losing second place when their mast snapped on the final leg of the last race of the day! Also a big well done to Josh Clarke and Hannah Fagg who came 7th. WYC wishes them luck in the Spitfire Nationals next weekend. Please be aware that from Monday, 19th October 2009 the bar will close lunchtimes from Monday to Thursday. THE BAR HOURS REMAIN UNCHANGED FOR THE EVENINGS. The bar will remain open on FRIDAY LUNCHTIMES and continue to serve food. Tony and Julie Dod proved that marriage is obviously the formula for success. The newlyweds did well at Datchet this weekend where Julie won the Ladies' Dart 18 Nationals and Tony came 4th in the Single Handed Nationals. A big well done to both of them. David Lowes and Donna Hender (back by popular demand) have agreed to provide pre-quiz food on 9th October. Tickets to be sold behind the bar at £6 per person. The menu will consist of southern fried chicken or cajun king prawns served with chips and salad. Food will be served at 6.30pm and the quiz will commence at 8:30pm. ...who achieved Class 1 bullets last weekend at the Island SC (Nab Tower) and Royal Corinthian (Tiny Mitchell Trophy - which his crew also won overall) events. 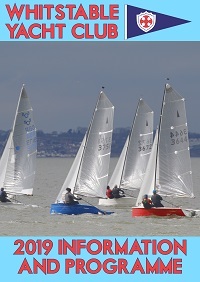 This means that his crew have won the IRC Solent Series 2009 Championship Overall as well as Class 1. (from 70+ boats). Great news for our WYC cruiser sailors. Congratulations to Andy Peake and Graham Oliver who finished second and fourth respectively at the Musto Skiff European Championships at Lake Garda. And well done to Francis Stileman who was the oldest competitor in the 74 boat fleet and finished all 12 races. Watch a replay of day 3 at the Merlin Nationals 2009 held at Whistable as seen by the club webcam over a 24 hour period. Courtesy of WYC member and Cherub sailor William Lee. Unfortunately Friday EVENING food has not been as popular as we had originally hoped. Having listened to various opinions we have decided to provide a more substantial, freshly prepared, home made dish, possibly with a theme, once a month. We propose to start this Friday 28th August and will publish the proposed menu shortly. Friday lunchtimes however continue to be popular so these will continue. Bar and Catering Committee. WYC. 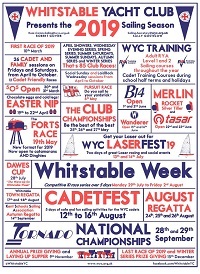 Last year we wrote: "Congratulations to Christian Brewer who, crewing for former Whitstable member Stuart Jardine, has just won the XOD Captains Cup in Cowes Week from a fleet of 80 boats over 8 days of racing. This is the sixth time Christian has won it with Stuart, and its Stuart's seventh win." Well - they have done it again, in another 80 boat fleet. Two years in a row and a seventh championship win for Christian and an eighth for Stuart. How impressive is that.